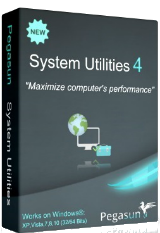 Pegasun System Utilities Premiere 4.60 war am 6. August 2017! als Giveaway verfügbar! Das umfangreiche, preisgekrönte Paket für euren PC! Es hilft euch beim Reinigen, Beschleunigen, Verwalten, Sichern und Reparieren eures Betriebssystems und garantiert, dass eure PC wie neu läuft. Optimiert eine Vielzahl Anwendungen inklusive Betriebssystem, Internet, Browsers, Spiele usw. Speziell für Laptop-Besitzer: Verlängert die Batterielaufzeit, denn je weniger nutzlose Programme im Hintergrund laufen, desto länger hält die Batterie. Gamer, für euch hat dieses Tool ebenso einen Vorteil, denn Spiele laufen ab sofort viel schneller und reibungsloser. It is programs like this that make me wish Karl (remember him?) was still around. Robert Maguire, ... and even Giovanni !?! Yes they were very good , I miss their comments too and always saved their comments on programs that I installed . I wish them well in what ever venture they are in now . Right on the main page it says "5 years in the market. Over a million downloads. Winner of multiple 5-star awards." Yet when you check their about me page the company was just founded this year 2017.....so how is it 5 years on the market???? and what 5 star awards? from who? when? million downloads already in under a year? Right on the main page it says "5 years in the market. Over a million downloads. Winner of multiple 5-star awards." Yet when you check their about me page the company was just founded this year 2017.....so how is it 5 years on the market???? and what 5 star awards? from who? when? million downloads already in under a year? If somebody finds fuller review, please post! Understand reluctance to try this. (Some years ago, a "deep clean" from another software house totally ruined my PC! Be careful if you have dual boot; sometimes these cleaner programs don't understand that the registry items for duplicated software need to be on two separate partitions). However there are some very brief but positive comments on this software here: http://www.softpedia.com/get/Tweak/System-Tweak/Synei-System-Utilities.shtml (Pegasun used to be called Synei) If somebody finds fuller review, please post!